Our range of gondola and retail shelving has a cost effective solution for your display needs. No matter what type of stock is needed to display, MSP Shopfittings will be able to find the best way to expose your product to your customers. Long Span Shelving is a module frame and beam shelving system that caters easily for large bulk items. 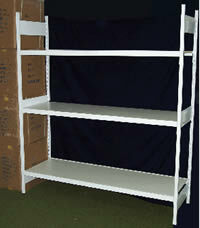 This type of shelving is available in a combination of sizes that will suit most requirements. 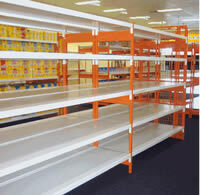 It is an economical alternative to pallet racking, and is supplied with timber shelves. However, Metal or Mesh shelves are available. Shelf levels are adjustable. The system is fully height adjustable from 200mm off the floor right to the top of the frame. Long Span is provided with adjustable feet at each corner. Long span is manufactured to standard and custom sizes.